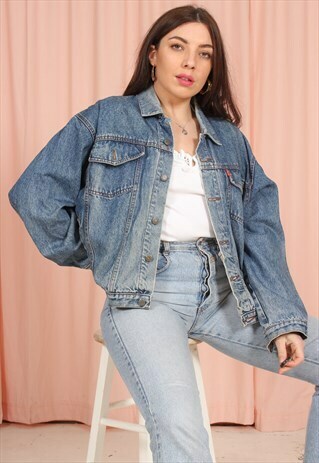 This vintage Levi's jacket comes in a dark wash denim with pockets to the chest and side seams and a button closure to the front. CONDITION: Excellent Vintage Condition. It's been loved before but you'd hardly notice. SIZING: Will fit UK size 12-16 depending on how you'd like it to fit. Our model is a size 10 and 5'6. Not all love affairs work out so if you need to return your Dirty Disco order then just get in touch within 14 days. We'll then send you all the details you need to return fuss free. Got a few questions? Tap the envelope below and we'll get back to you as soon as we can.